Love That Max : Monday Morning Confessional: Are you done having kids? Monday Morning Confessional: Are you done having kids? 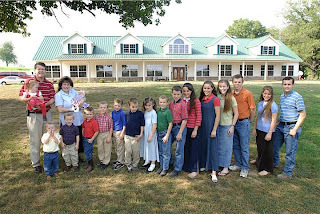 This Arkansas couple, The Duggars, has 18 kids (their latest is just a few days old). Kind of makes two seem like cake. Recently, there was a lively discussion about third kids on a mom e-loop I belong to, something Dave and I have been pondering for years. Some moms talked about how two kids are manageable, but with three everything is harder—traveling, eating out, finding a sitter, affording them all. One mom who'd had two kids followed by (surprise!) twins said she thought it would put them over the edge, but the twins have been great for their family. Another undecided mom mentioned that one thing she can't shake from her head is the number of older people who have told her they wish they'd had more children. Then there was a mom who told of meeting a woman with four kids. She asked how she knew she'd wanted a fourth, and the woman answered, "When I thought of my family portrait on the mantle, someone was missing." On most days, I'm plenty happy with two kids, and plenty busy. I worry that having a third would detract from the attention I give Max, and he needs as much of my attention as he can get. And I worry that three is tempting fate. Max had a stroke at birth, Sabrina was born perfectly OK. Could we have another healthy child? But, then. I love children. A third could be beneficial for Max in all the ways that Sabrina has been—he sees her doing stuff and he's motivated to do it (though I wish she hadn't taught him to pour bubbles into the coffeemaker). A third child would also be around to help Sabrina look after Max someday when Dave and I are gone. Life would be hectic, sure, but we'd settle into some sort of routine, just as we did with one kid, and then two. Our latest thinking: ????????? And furthermore, ???????????? So, I ask: Are you done having kids? Why—or why not? Go get busy Ellen! If your nervous about 'tempting fate' that don't try, but don't prevent. If you grow anther, great, if not you will probably still feel okay. Tony and I were done having children after Jacob because he had bad food allergies and colic, and I had SEVERE post partum depression. I never, nor did I ever think of hurting my children, but I did feel as though I was bordering the post-partum psychosis stage. Plus Jacob was in the NICU, and that just sealed the deal for Tony. He cannot handle the NICU. I wanted anther baby right after having Jacob, but changed my mind a few months later. We had finally decided to finalize our decision, Tony set up an appointment for his vasectomy last October, and then missed it. He chickened out. So we then set up a new appointment for November. And while we were in Mexico in September, we talked about another, saying it would be nice, but that for me it isn't such a good idea. Not only do I seem to give birth to sick babies, but I also get incredibly sick myself. Pre-eclampsia with both pregnancies. And now I had chronic high blood pressure that I required medication for. And then the post-partum depression that I was finally coming of. I didn't want to go back. I couldn't go back. So bring on October...we were having a dry month, so we only had relations ONCE. I am embarrassed, but we were busy with life and work. And our ONE time in the sack, with a super early withdrawl (pull and pray as they call it!) and we wind up getting pregnant. I think I tested positive on October 27th...his vasectomy was on the November 9th. He still went. Fast-forward nine months, healthy pregnancy, I went into labor on my own (which was a first) and gave birth to a healthy baby girl. It was amazing. I am so grateful for her. She has healed me in ways that I didn't know were possible. Tony and I fell deeply in love with her the minute we saw her. It was just he and I in the labor and delivery room with her for an hour. No nurses, no doctors, my midwife had left. We just sat and enjoyed her, looked at her, were totally amazed by her. Can you tell I am totally in love with my daughter??? To us, our family is now complete. Victoria was missing from our lives, and is meant to be with us. Her brothers absolutely adore her, and Daddy is beside himself with joy. And then there is me...happier than I ever have been, and healed from two other traumatic birth experiences. It has been an adjustment. But going from 1 to 2 was much harder. Victoria just slipped right in. I am busier. A lot busier. But I also have 2 boys that are in school. We are out numbered, but we honestly cannot imagine life with out our baby girl. I say go for it Ellen! Kids are WONDERFUL! Even if they pour bubbles in the coffee maker! the circumstances of Noah's birth were very very traumatic for me, and the aftermath is something I am still struggling with. That said, I always wanted to be a mom, and more exact always wanted four kids. When my hubby and I were dating he made it clear he NEVER wanted 4, so we settled on 3 and that was always my "plan". We just found out we're pregnant with number 2 and are very excited. I'm also nervous because I'm considered "advanced maternal age" at 35 and work in a children's hospital. I know all the things that can go wrong, but I'm praying for a healthy baby above everything else. It took us awhile to decide on number 2 because our Abby wasn't the easiest baby. She's now 5 and can't wait to be a big sister. I say go for it! my husband has twin 14 year old, then our two. He had said he was done having kids after our first, but I wanted another. I have wanted more, but am now really nervous about it. My daughter has a progressive disease that could possibly be genetic(although we have not found anything saying it is), then my son is autistic. Sometimes I am so busy with these two that I dont know how I could manage a baby. The past year was difficult in the hospital quite a bit with my daughter that I thought I could it be fair to anyone to have another child? I dont know. Then I had my annual appointment and my doc brought up a procedure to make it final at not having another...that brought so much emotion that I know I do want another...not sure if I will try for another...but I know I dont want to do something to make it so I cant for sure. Then after discussing it with my husband...he a week later confessed he would like another someday, maybe in a few years when he is done paying child support and we have a child full time in school. Of course I will be 40 or almost 40...so that brings up more questions. Eric and I have always wanted 2 or 3 kids. After Caleigh was born we have stood back from our way of thinking. Maybe when Caleigh is more stable, maybe when she is in school. Is it fair to take the attention away from her when she needs so much? And would the new child suffer from not as much attention? Hmmmmm.....We're not ready yet, but we are definitely in a different place than you. Have a new years baby! I think a new years baby sounds like a great idea!!!! But, I think you should have twins this time like my friend Rebecca! I'll start thinking of good names!!!! Hope you and dave are having a GOOD chanukah!! We're currently hoping for a second child and I don't know if we'll stop after 2. We're of the mindset that we should leave the details up to God while we take care of the things He's already given us. I have four children. I have been blessed with four great pregnancies and four healthy kids(for the most part). I never knew how many kids I wanted. I had a friend tell me I would have ten:) I don't think that many, but we have not made anything final. Hmm we're still contemplating this one. But my gut is saying Yes we are done. I don't know if it's fear that is over-writing this decision but I did grow up as a single child for the most part (until my step-sister joined the equation at 9 years of age)and I honestly don't know what it is like to grow up with a sibling (as she did not live with us). My grandma on the other hand is always telling me two is best. When you are old and all your friends have "left" you will only have your siblings to relate to...it's a good point. but I am still too scared for a number of reasons 1) (this sounds bad) but What if I don't love the second child as much??? Gabi is my life and because of the traumatic entry into this world.. is it possible I don't have enough love to share with a second child?? 3) finance? How much extra help will Gabi need in the future.. right now it looks like not alot of extra help will be needed but how do we know? i'm too scared for now.. decision is yep We're done! We have four and I love having them! They are my true blessings. We leave it up to the Lord primarily if we'll have more. I don't believe in bc (due to my faith and health reasons) so I'm sure we'll have more. My husband would love to have a couple more boys. Really, after 3, it's not much more difficult to have another child. It's the transition from 2 children to 3 that is the most difficult in my experience. I've also had many people say they are glad that we didn't stop at 2 because they regret not having more. If they were to do it over, they would have had more children. You never hear anyone say that they wish they didn't have as many children as they had. I agree that having another child would be a wonderful blessing! Two is nice, three is perfect. Though I was done at 3...then we decided on #4. Now I know that I am REALLY done. However - I am totally open to renting out my uterus ;) I have very good pregnancies and fast deliveries. I would love to be a surrogate, but have no interest in keeping any more kids it this house. I love the ones I have, and they are plenty!! Thanks, Ellen, for stopping by my blog! I think this is such a personal decision - about what you can handle - are you a 10-ring circus kinda gal, 3-ring or 1-ring? Knowing yourself is critical. We stopped at two, although thought seriously about having a bunch. We did end up "adopting" kids here and there for spurts. One night one of our daughters came home from having dinner with a friend, and said, "I told Mikey he could come live with us." The next night he did - for three years! Now that our girls are grown we are foster parents for teenage girls with Shelter Care, Inc. here in Ohio. Thanks for the alert that you were addressing this topic...what a fun one! My husband and I in our pre-marriage discussions agreed we felt two children was the "right" number for us. When we became pregnant with our twins Darren and Sarah straight outta the gate, that "solved" that! Of course we'd envisioned two pregnancies, two children at "different stages"...basically having the parental opportunity to enjoy the path of parenting "twice." To have another child to simply "re-enjoy" the baby stages, or to prolong the era of being new parents seems the wrong choice for us. Tempting, but wrong for our family. To the Duggars with 18, or families with one, I say the number choice is uniquely your family's own. May you be blessed with as many -- or as few -- as is right for you. thanks for stopping by my blog...I'll be revisiting here! Ellen, sometimes I feel like you are reading my mind! Great post. We have been going through a VERY similar discussion and I have almost exactly the same reasons for wanting/not wanting a third child as you. Like your friend who felt there was someone missing from the family portrait, I feel (have ALWAYS felt) that I am supposed to be a mother of 3. And even though I dread to think how on earth I will fit everything in, I know that we just will. I will keep you posted ;-). I'd love to have more kids. Before having Elijah, I wanted FOUR. My husband, in his infinite wisdom always just said, "Let's have one and take it from there." We both want more, but Eli's birth was pretty traumatic. Ok, really traumatic. I've wondered if I can do it all over again. The answer, I think, is yes, but I'm just not ready yet. Elijah is 16 months old at this point and I haven't healed completely emotionally to be able to even contemplate having another. But, I know I will. Hmm, perhaps I should show this post to my husband in an attempt to get him to catch the baby bug! We've discussed it before, and I don't think we're done having children. Daniel is our one and only at the moment. Like you said, I worry about him being alone when we're gone. He has plenty of cousins and he's a very outgoing boy who has no trouble making friends, but still... it's not the same as having a sibling. I think about how much fun my siblings and I had together, and I want that for Daniel. The feeling becomes especially strong around the holidays; I can't shake an image of a much older Daniel all alone at Christmas. No, I'd like him to have the squabbles, chaos, and fun that come with having a brother or sister. Confession time: when Daniel was diagnosed with his stroke, I wanted to TTC right away. I in no way, shape, or form wanted to "replace" Daniel - who could ever take my little angel's place? Rather, I wanted to make sure he had someone to protect him when he got older if need be. I worried about bullies, lonely holidays, and everything in between. Of course, we decided to focus on Daniel's therapy and put Baby #2 on hold, but that's when I knew for sure that I wanted more children. So far, Hubby agrees with me. I have two children. Our first was totally "by the book" and the pregnancy went smoothly, except I developed Gestational Diabetes, but that was ok.
My second pregnancy was a problem from the 5th week on with a lot of bleeding, my son wasn't growing and he wasn't moving. He was born by an emergency C-section after his heart rate started to drop. He was 9 weeks premature, had intra-uterine growth retardation and was small for his gestational age (he was only 2 1/2 pounds and 14" long). From that pregnancy I'm considered "high risk". I could deal with it if I have to, but I'm 40 years old now. We also live in a tiny one bedroom condo. If it was physically possible to have another child I would in a heart beat. I would so love to have another child. I think about it all the time. But my age and our tiny one bedroom condo does not allow for that to ever happen again. Wow. What an incredible outpouring of thoughts, so much good wisdom here. Thank you so much, everyone. It definitely is a harder decision, in some ways, to make when one of your kids has special needs. And Cheryl, I liked what you said about deciding not to have a child to enjoy the baby stage again. I am a total sucker for babies, and I fully realize that it is not a good thing to factor into the decision. Again, I appreciate everyone sharing their thoughts. Whether or not we have any more kids, I'd say we are all pretty great moms. We are done, but after 4 kids. It is CRAZY, don't get me wrong, but in a fun, somewhat rollercoaster-enjoyable way. I wouldn't have it any other way. We're in the same boat right now. We love our two, but I always wanted three. We're passed all the diapers, cribs and mess so it's hard to think about going back. We recently had a similar post on this over at www.babybunching.com. Our answer is simple: No, we are not done having children. I never imagined my life with one child and I don't intend for it to be that way. Does having another baby make me nervous? Absolutley. The what if's are endless and scary, so, so scary! BUT, I can't let that stop me. I have thought deeply about what if I get pregnant and the next baby has a stroke? That is just not enough to stop me from bringing another child into the world. I see how fine Leah is, yes, she needs help--but she's wonderful. I will have more children, eventually! Right now, I need to focus on Leah. I know it's scary, but children (all of them) are gifts! I know you know that...I truly believe that there is a plan for all of us. If you are meant to have a third you will! I came from a family of two, and so did my husband. I never thought of myself having more than two, but we had our first two close together (19 mos. apart) and I felt like it was such a blur. I didn't feel like I was done. We travel a lot because our families are all spread out, so it was a consideration, but I just thought, "So, I'm not going to have another kid because we'd have to get a cot in our hotel rooms?" We decided to go for #3 and now we have three lovely boys. We say that 3 is the new 2, because so many of our friends have done it as well. I say go for it! I have one child, and are grateful for him. We don't plan others. He is adopted, and we went through a lot to get him. And, this was after years of fertility challenges. We get asked about his being an only child, but we know he is it for us and don't think further about it. I agree with what people are writing. It's whatever works for you and where you're at in your life. Get quiet. Trust your gut. And, you'll know what to do re: having more children. It's definitely a personal decision, but I'll share that for me, going from 2 to 3 was MUCH easier than going from 1 to 2. Going from 3-4 was the easiest transition of all, mostly because I'd learned so much about relaxing standards and not *expecting* anything to be easy...like, ever! I'm now expecting #5 and hoping for a transition as easy as the last. I think so much of it depends on your circumstances at the time, age gap between kids, and the baby's personality/sleep habits, etc. And of course, there's no way to predict that last one. I think if you really want another child, then all the logical arguments against it don't count as much. (on the other hand, if you're on the fence, then those logical arguments can make sense of a muddy decision). Good luck, no matter what you decide! Having a larger family is a lot of fun, and I wouldn't have it any other way, personally...though I can definitely see the benefits to stopping at 2. I have four, so I have obviously passed the two vs three issues. I really can't say whether I am done or not. It is hard to find a sitter, but that's the only issue I really have. My kids are awesome. We h ave been blessed to have four really healthy kids. I think it takes some families with two kids, some with three, some with four, and some with 18 to make the world go 'round. I could see myself having maybe one or two more, but I think that is all that is meant for me. Yep after 3 boys and no girls. One preemie and 2 almost preemies .. I am DONE!! I am finished after having four. I couldn't go through another pregnancy - I'm getting too old. Having been pregnant in my teens, my 20s and my 30s, I know that it was so much harder the last two times around. We are a bit different in that our child with cp was our 3rd. Hubby and I made the decision that we would have another child when no 3 walked. When no3 got to 2 years old and it became apparent that he was never going to walk, we made the decision to let fate decide. And it did - with a whirlwind our little trouble maker came along and has kept us on our toes since. My pregnancy with him was not without its dramas and soul searching as we faced a real possibility at one stage of having a child with devastating medical condition. Fortunately, things worked out in the end. My reasoning for another child has been a little bit different. I wanted No3 to have as many siblings surrounding him as possible to help him out as he grows old and when we aren't around any more. And to be honest, having siblings to play with can be a great form of therapy. I am fairly certain we are done. Not because we want to be. But, b/c my body has failed me. Long story. We've kept 'adoption' an open topic and may consider it after I am done with school. Hiya, its so nice to meet you! I understand your dilemna exactly - Ross and I really struggled with deciding whether or not we were going to have a third. in the end though, I desperately wanted another child. When I had Toby, I was young, had not come from a good home, had a traumatic birth and then wound up with post-partum depression. I didn't have much time enjoying Toby as a baby. With Chloe, although the actual labor was much easier, she had so many difficulties. On top of that, I got post-partum depression again and Ross and I were fighting all the time. Our health visitor (in the UK) believed that WE were the ones causing Chloe to 'not thrive' (even though the doctors said that she was thriving) and so she called child protective services on us... it was just a nightmare. Things got better once we got Chloe's diagnosis (and kicked the social worker to the curb) and then two months after that my post-partum depression ended, but we literally had to pick up the pieces of our life and put it all back together again. I felt like I'd missed out with both of them, I had not really had a chance to just enjoy them when they were babies, and I was so jealous of everyone else that was able to do that with their children. On top of that, I'd always wanted a big family, so to stop at two would have been heartbreaking for me. So, we thought about it for awhile. I probably thought about it for six months or so, and then decided that I was ready for another. Poor Ross got the shock of his life! LOL He took another 2-3 months to come around to the idea. Originally we decided on a few things: one would be that we would get an amniocentesis done, and the other was that I would get antidepressants ready in case I got post partum depression again. In the end, i did not have the amniocentesis. I was about 3-4 months along at the time, and had started to slightly bleed. That had never happened to me before, and it really scared me. We had a thorough examination done, but I would not let them do an amnio as I was scared that I would love the baby all together. I did get the antidepressants from the doctor ready 'just in case' though. Anyway... so it is a gamble, I guess you just have to decide how much you want it and what you are okay with. There's always the chance that another baby will have a special need... that chance might be small, but it is there, so you have to decide what you want to do. Before I was pregnant, I would have said NO WAY to having another special needs child, but after I was pregnant, there was no way that I was giving up that fetus for anything! Yes I'm done. Three is enough! I wish I was young enough to ponder this question. I we hadn't adopted out first child when I was 42, I probably would have pushed harder for more. Having said that, PunditGirl has a lot of anxiety-related issues -- some related to attachment and adoption -- that drain me most days, so I'm not sure I could have handled it. I'm assuming that somehow we know when we are "done" and what number is right for each of our families. I KNOW that 18 would never have been right for me! Welcome to our Florida vacation! How much patience have you got? Any singers in the house?